Finally decided to stop working on this block. 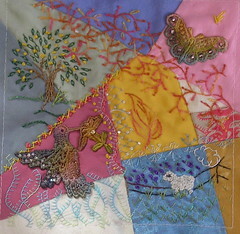 I would like to have done a bit with the butterfly batik, but....it's pretty the way it is. This is rather a healing type block. I have added some lemon citrine and some aquamarine gems stones known for healing. 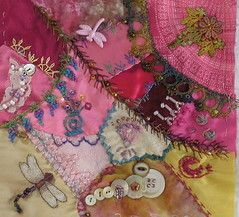 This block along with some others i've been showing, is a part of a quilt to commemorate a dear friend and remind me of her courage, humour, kindness and love. There are many other bits on this block alone that remind me of her, which makes it even more special. It's time to start considering what I need to do with the sashing, etc. Guess I better go ponder! going on! I love to add dimension to the cq blocks I do and find I use quite a bit of variegated flosses as are shown in the pansies to the left of the block. I used up some stray bits of thread and create the little fuzzy flowers on the window sill! Great fun! Off to get things done! Hope you enjoy! This is a second bib (a piece of fabric that buttons to the front of a western style shirt) that I did for the same re-enactor. I hand drew the design, scanned it and digitized it. This piece is leather "suede" with fringe. The whole shirt is leather actually. Its and awesome piece. 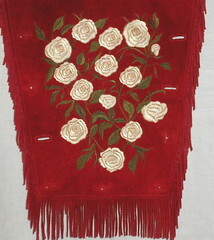 Anyway...from the designing of the flowers to the digitizing and machine embroidery....I spent about 60 or 70 hours to completion. It looks super in person. I was amazed that the embroidery actually had an antique quality to their coloring, which is good considering that is the image the owner wants. Authenticity and originality! This is another piece i'm proud of and thought I would share! Embroidery is my "life blood". Literally! If i'm not digitizing (creating the computerized version of a design where I tell the machine to place the stitches) designs and logos i'm working on projects like I posted yesterday! 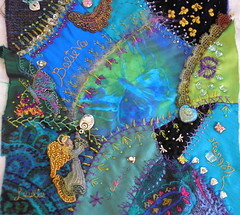 Needless to say, I LOVE crazy quilting and I LOVE embroidery! LOL! 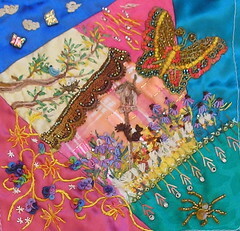 That said, this is a sample of a project that I just finished that I drew out by hand from aged pictures then spent approximately 60 to 80 hours on creating it on the computer then two and half hours in the actual machine embroidery. I'ts a massive design. There are over 100,000 stitches there. That's a lot when you consider the average logo is about 8000 stitches! But....the owner was speechless and quite happy so...that's what counts! :_) He is a western re-enactor and these flowers are a modern day version of the flowers that can be seen on Buffalo Bills shirts. I am actually quite proud of this one. It came out very well and I don't normally brag...but had to with this one! This is a block from the DYB rr that I am participating in. This has been sooooo much fun! It's great to be able to see what everyone does on these blocks! On this particular block, the center patch had a silk impression of a feather that I thought would look good outlined or beaded. 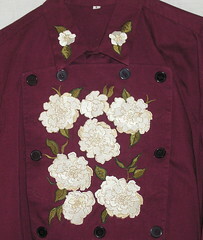 As you can seen, the embroidery is all I did. I wanted to keep this block a bit more airy and light in keeping with the colors and think I succeeded! The owner of this block raises sheep so I gave her a mini version that won't require quite so much maintenance! :_) The vine is done in a Caron watercolors thread and i'm realy pleased with the way it helped pull together the yellows and pinks in the patches. Then...my (sorta) trademark, a tree. This one is a bit different and is more along the lines of an oak. I hope she enjoys it! 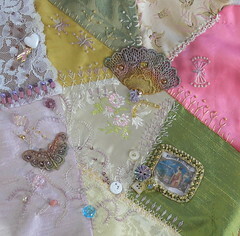 Last, but not least in the project is my Madame Butterfly block! I'm not as good as I would like in the pre-planning phase of block creation so the use of braids and lace and such are an oddity for me. However, I thought the lace soften the overall look on this block and I finally found a trim the blended with the silk print enough to let it shine. 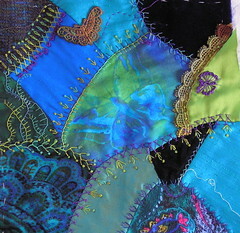 I again added some stitch variations to the seams and some dimensional embroidery. The beads are huge by my standards, but...that soon will be corrected as well! Another completed block!! Woohoo!!! Rather the same scenario as the others. Not quite as much beading on this one. 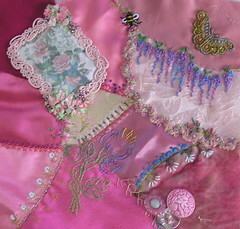 I did a bit of ribbon work, added a brazilian embroidery bee and other dimensional embroidery into the seam treatments. This isn't quite as encrusted and probably for the best as it allows the silk print to show a bit better I think! Another of several finished blocks for an 8 inch block project I’m working on. I’m feeling a tad rushed but things are pulling together. This particular block is more of a dragonfly theme, although all of the blocks for this seem to have fans of one variety or another as well as other insect life. I’ve done a smidge of dimensional embroidery and stitch variations. The beads are a bit larger than I normally enjoy using, but the ol’ glasses bit the dust and I’m waiting for my dr’s appointment to tomorrow to get some new ones! I like to do button trails…but I’ve got a long way to go before they look as good as Annies at http://www.loopylace.com/anniescrazyworld/ and Sharon's at http://inaminuteago.com/blog/index.phps! Oh well! Practice makes perfect, right? Just like figuring out these durned links! GOT to learn that HTML!! LOL! I’m making a bit of progress on a project I’ve gotten involved with. This block is nearing the end of my actual embroidery phase and will then go to adding beads and buttons which will draw the whole block together for me. I’ve done some dimensional embroidery for some variety and added some stitch variations as well.